Hatching Crocodile Egg | Grow Your Own Pet! Grow Your Own Croc Pet! Raising your very own crocodile is the coolest thing since Jurassic Park! Simply purchase one of these life-like crocodile eggs, submerge it in water, and watch as it begins to crack and hatch after 24 to 48 hours! When your egg has completely broken open, leave the shell in the water and your pet will continue to grow up to 5 times its original size within a couple of days! These surprise pets are cool and undemanding, but most of all they're kind of intimidating... So why not amaze your children with this educational and fun experiment today? 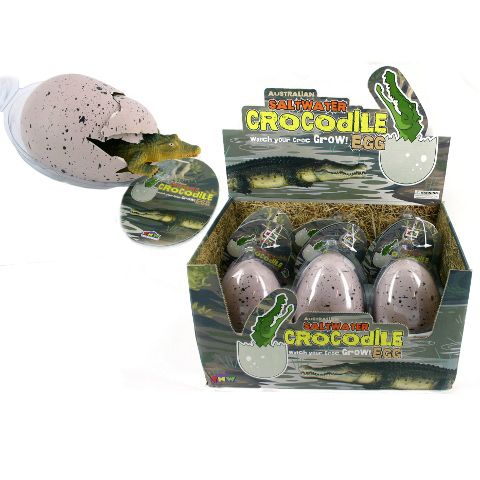 Hatching Crocodile Egg's are non-toxic and safe for children ages 3+ Each sold separately. I bought it as a gift for a five year old and he loved! bought for a grandchild who was delighted so I was told. I was extremely happy with the crocodile eggs! These are fun, especially if you are four years old, like my son. He loved watching the egg crack open and the crocodile appear, then grow over a week or so to twice the length of the egg. Each morning he would rush downstairs to check the progress. The eggs are realistic in appearance (not that I have ever seen a croc egg) but the crocs themselves are more toy like. The snout of the croc cracks open the shell over three days before pushing right out of the egg. Recommended by me for little (and big) kids. You need a tall clear vase or large clear bowl of some sort to fully appreciate them. The service from CoolThings was good and the eggs arrived when they were supposed to. The product was great, and the service hassle free. Very quick service. They let me know all about my product every step of the way. When i had paid, they were sending it, etc. The gift will be a stocking filler this xmas for my son. Unusual product... So he will like it. When i have spare money i will be shopping with cool things again. As a single mum it is hard but my money was well spent as the unusual cool products you have my son will like and he can talk to his friends about them. I was very taken with the promptness of the delivery of the product I purchased from you and my granddaughters whom I bought it for were absolutely stoked with the uniqueness and the quality of the crocodile eggs. They were also good value. I will most certainly deal with you in the future.